Download the theme file here. A good theme with pleasant colors for eyes, is perfect for the blog, thank you! Great theme, very simple and pleasing design. I would like to thank you and Sophia Lucero for this theme design. I am already using the Rubidious theme on one of my existing blogs and like it very much. I guess now this 3-columned Avacado will be another addition to my blog layout. Cheers!!! 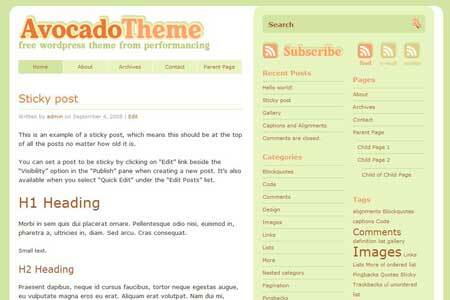 Wow, avocado theme is a very nice theme to use. Green is classy and unique. Thanks for this good theme. what adsense plugin u use? It looks elegant and very refreshing. Go green!